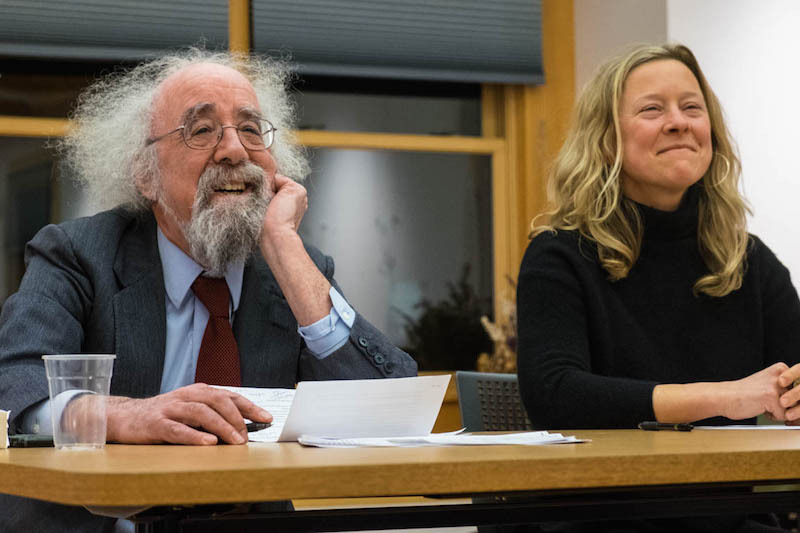 Ron Rappaport, MVYouth board member, and Lindsey Scott, executive director, were all smiles Tuesday night at grant awards ceremony in West Tisbury Library. 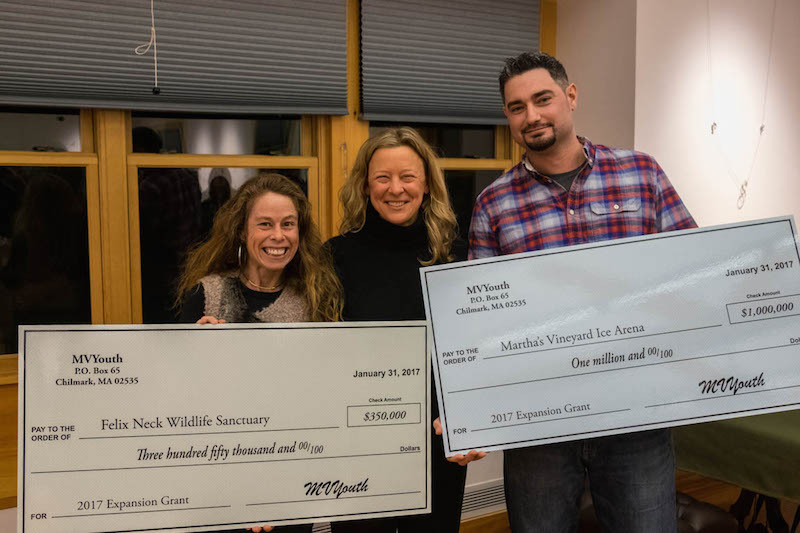 The Martha’s Vineyard Arena and Felix Neck Wildlife Sanctuary will complete major capital campaigns this year thanks to $1.35 million in expansion grants announced Tuesday by MVYouth, the community fund founded three years ago. A $1 million grant for the arena — the largest grant to date awarded by MVYouth — will allow the Island’s only ice rink to complete a $3.7 million upgrade of its aging facility. A second grant of $350,000 will allow Felix Neck to expand a new barn from a three-season to a four-season educational facility that includes a nature-based preschool. The wildlife sanctuary began 52 years ago as a natural history camp for children. The grants were announced in a ceremony Tuesday night at the West Tisbury Library. Both recipients were recognized for their contributions to the year-round Island community. MVYouth executive director Lindsey Scott recounted the long history of the arena, built by hand as an open-air ice rink some 40 years ago by a group of skating enthusiasts. “When seats were needed, benches were added. When it started to rain, they built a roof,” she said. The rink, which serves hundreds of Island families through hockey, figure skating and other programs, also drew praise from MVYouth leaders for the recent hard work done to strengthen the organization. In the past year, the arena hired general manager Peter Lambos, developed an administrative support agreement with the YMCA of Martha’s Vineyard (housed next door), did a formal indoor space needs analysis, hired an accountant, upgraded its technology, replaced the roof of the facility and raised $2.6 million for the larger project from private donors, foundations and the community. But Ms. Scott returned the thanks to the recipients. “It’s because of your hard work these wonderful programs are available to our youth,” she said. $1 Million for the Arena...that's great news for the Island youth. I have seen credit go to a lot of people, but would like to thank Bones for his dedication. His tireless hard work and effort have enabled the rink to sustain well past it's expiration date. Bones, your efforts do not go unnoticed. Amen Art !! Without dedicated staff like Eric a/k/a Bones the Rink could not have exsisted for this long. Island men ROCK !!! We are so thrilled for both organizations, and appreciate the vision of their leadership ! We personally cannot wait to see the barn at Felix Neck come to life!